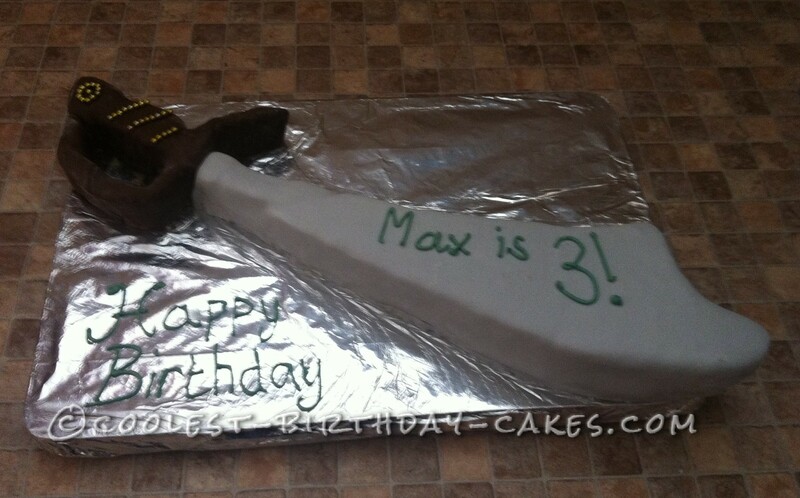 I was asked to make a pirate themed cake for my friend’s little boy’s 3rd birthday so I made a pirate sword cake. They haven’t seen it yet. The most difficult part was the handle. It’s not perfect but I’m pleased. My little boy kept interrupting me wanting to help but its not the best idea letting an 18 month old help so I had to wait until he had a nap! I don’t make cakes professionally and only made my 1st cake on my eldest boy’s 2nd birthday, which was a digger and so may try to upload that picture. Birthday cake idea Posted by Hannah D.
Hello! I’d like to ask you a favour. Could you publish a recipe for this cake?? Please! I want to do sword cake for my friend for his birthday . This cake looks fantastic….